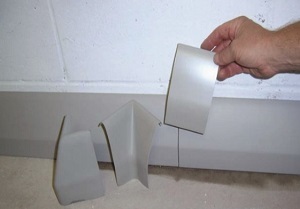 The basement waterproofing DRY-UP™ Baseboard System is a unique water control channel constructed of high-strength space-age polymer adhesive that attaches to the existing concrete floor and is designed to look like a finished baseboard. The hollow baseboard is 5 inches tall and extends 2 inches from the wall. Our unique system is engineered to be used with any type of foundation including old stone or brick walls, poured concrete walls and block walls. In block walls, weep holes are drilled into the hollows of the blocks to alleviate water build up inside the foundation walls and to insure proper drainage. The basement waterproofing DRY-UP™ Baseboard System is professionally adhered to the basement floor (where the floor and the wall meet) to prevent water seepage from passing out onto the basement floor. The installed basement waterproofing DRY-UP™ Baseboard System channels the water from the basement walls and from the floor/wall joint to our Champion Sump System, discharging the water from the basement. The DRY-UP™ Baseboard System is the best interior solution for homeowners with monolithic foundations. Monolithic foundations are built with the footing and floor as one piece. The floor cannot be cut and removed because this could potentially cause structural damage to the foundation. Installing the DRY-UP™ Baseboard System takes are of the leakage from the basement walls without having to cut the floor and causing potential structural damage. The basement waterproofing DRY-UP™ Baseboard System can also be installed in finished basements. First, the wall covering (Ex: paneling or drywall) is fastened securely to the basement concrete wall. The bottom portion of the wall covering is then cut off and removed so water seepage will not wick up the wall. The basement waterproofing DRY-UP™ Baseboard System must be professionally installed directly on the concrete floor so any installed flooring is pulled back and can be put back after installation. The basement waterproofing DRY-UP™ Baseboard System then captures any water coming in and channels it to a drain or sump pump – protecting a carpeted or finished floor from water damage. Homeowners love that they can add more comfortable living space to their homes by eliminating their wet basement. The DRY-UP™ Baseboard System is designed to look like a finished baseboard and can be painted with an oil-base paint to match the décor of any room. Homeowners tell us they like the way it naturally blends in. Their friends are surprised when they discover that homeowner’s basement waterproofing DRY-UP™ Baseboard System is not just a common baseboard, but rather a water control system to prevent a leaky basement. When installing the basement waterproofing DRY-UP™ Baseboard System, it is important to properly clean the floor along the outer interior basement walls to ensure proper adhesion. Based on 50 plus years of personal basement waterproofing installation experience, Resch Enterprises Inc offers basement waterproofing contractors specialized equipment to make the cleaning process more effective and efficient.